Micheal Bay takes a step away from making a 2 hour explosion film to what will end up being one of the craziest and most fun stories to be released this year. The story revolves around three musclemen on their twisted pursuit of what they believe to be the American dream. Between their ever delusion downfall though they continue to get into more and more trouble. The original plan was to rob a rich obnoxious man who deserved it but one thing after another doesn’t plan out. Getting to see them try to carry it out, think they succeed, and then watch their decline plays out great. It’s even crazier towards the end when they give the details about how this is all based off a true story. It is refreshing though to watch a Micheal Bay film that isn’t one giant explosion scene though. This one is a good mixture of action being carried by near constant comedy. This is done by the brilliant casting of Mark Wahlberg, Dwayne Johnson and Anthony Mackie as the three muscle bound wanna be criminals looking for their slice of the American dream. Mark Walberg pulls off being the brains of the operation with the real shine coming from Dwayne Johnson as the muscle who prefers not to use muscle. Watching his decline almost makes the movie alone. Anthony Mackie has his own great memorable moments as well but they are small in comparison in the roles done by Walberg and Johnson. Tony Shalhoub as well plays the man who they attempt to steal from but just won’t go down without a huge fight. Seeing him go from big shot to a nothing with his attempt to regain what was his is great. Better played by the fact that for the majority of the film he is limited to what he can do. 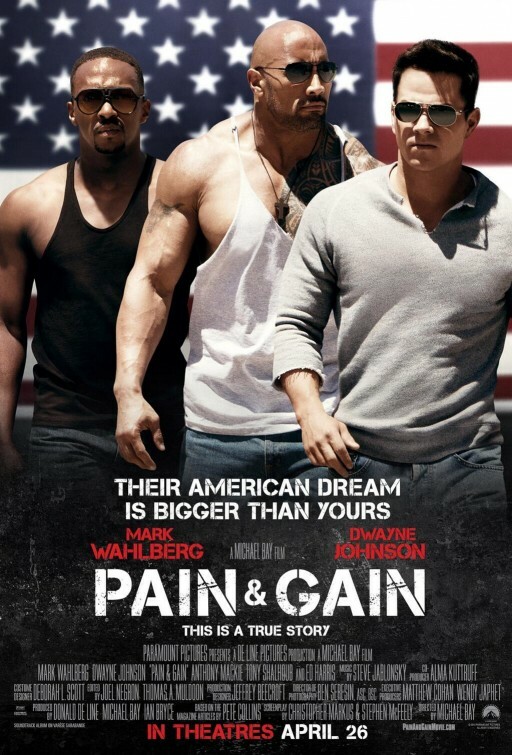 Pain & Gain is a film that should be viewed and remembered for what it does. It has enough comedy for most people to enjoy it just as that but with enough of a crime / action twist for many others to enjoy. Add a great performance by many actors and this is some of the most fun you’ll have watching a crazy story all year. I recommend this to most people, just beware of how crazy it can get though.